There are so many things I love about hot and sour soup and there are some things I don’t. When I order for delivery, take-out or dine-in, you will find some of the ingredients at the bottom of my bowl still remain. Granted, I squeeze every last drop of liquid from them, but I just don’t want to eat them. When I make the soup, I leave out the ingredient I don’t like, and still end up with a very yummy soup that makes me smile and every last drop and morsel is gone! This soup is said to be great for colds, and since I happen to have the start of a cold now (thanks to my son), what better time than to post this recipe. I plan on making a very large batch! This can easily be made into a vegetarian soup by using vegetable stock in lieu of chicken stock. To make it vegan, you can omit the egg without losing flavor (although that is one of my favorite ingredients). I use a combination of two mushrooms. You can use what you find or have on hand, if using canned mushrooms or re-constituting mushrooms, don’t throw out the juice. Use it. Mix tofu marinade ingredients and, gently toss in tofu and set aside. 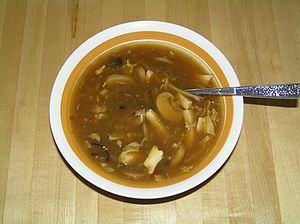 Re-constitute mushrooms (Hot water and/or juice from mushrooms and bamboo shoots), about 20 minutes. When reconstituted, slice mushrooms and reserve liquid. Grate the ginger, prep the bamboo shoots, and scallions. Mix together the 2 TBS soy sauce, 2 tsp white pepper, 2 TBS red wine vinegar, 1 TBS rice wine vinegar. Drain the mushrooms, but reserve the liquid. Add the cornstarch to the mushroom water and stir to dissolve, set aside. Add the stock and stir over med-high heat until it comes to a boil. Add in the cornstarch mixture and let come to a boil again, stirring and being sure to scrape up from the bottom of the pan. The soup will start getting thick now and can burn if left to sit on too high heat. Beat the egg in a separate bowl. Remove soup from heat and stir in circles, keep stirring and slowly pour in the egg in a steady slow stream. The egg will cook as soon as it hits the liquid and feather into the soup. Taste and adjust again if necessary. You can also add pork to the dish. Cut .5 LB pork loin into thin strips, marinade similar to the tofu marinade (with a bit of fresh ginger), and add in step 6. Grab a spoon, a bowl of this great soup and your softest tissues and eat that cold away! Posted by culinaryease on December 17, 2010 in Cooking for two or less, General Cooking, Recipes, Vegan/Vegetarian and tagged chicken soup, Hot and sour soup, Tofu.